We've given Easter ham a sweet, springtime flair by adding apricot preserves to our glaze. Lucky for you, this glaze can be made a day ahead. 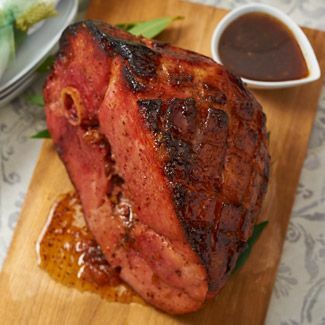 If you're preparing a 10–15-lb fresh, bone-in ham, preheat the oven to 325°F and prepare the glaze as directed. Place the ham in a large roasting pan and cook, uncovered, 18–20 minutes per pound, or until the internal temperature reaches 145°F. Baste every 15 minutes during the last hour. Let the ham rest before slicing. Serve with remaining glaze. This recipe is prepared with the Circulon Hard Anodized 11-Piece Cookware Set (K41886). Go to David's Recipe Item Page for the full list of items that David has used in his recipes. Remove the ham from the refrigerator and let it sit for 1 hour. Preheat the oven to 375°F and move an oven rack to the lowest position. Line a large roasting pan with aluminum foil and place a roasting rack in the pan. With a sharp knife, lightly score the fat in a diamond pattern; do not cut into the meat. Place the ham, fat side up, on the rack and roast for 1 hour. Meanwhile, make the glaze. Sauté the ginger in the oil over medium heat in a small saucepan. Turn the heat to medium-low. Add the preserves, brown sugar, vinegar, mustard, and cloves. Heat the glaze until the preserves and sugar have melted. Divide the glaze in half, reserving half to serve with finished ham. If you have glaze left over from the cooking process, discard it. Remove the ham from the oven and loosely cover it with buttered foil to keep warm. (The temperature will rise another 5–10°.) Slice and serve with warmed remaining glaze.